During small breaks at work I usually scroll on social media to keep an eye on the up-coming art shows in Karachi, Lahore or elsewhere to tag my colleague who handle news, blogs and social media for our online magazine. I came across a post on Facebook which was posted by Canvas gallery about their upcoming show which was a solo show by none other than, everyone’s favorite and a walking art institute, Sir Munawar Ali Syed. The show opened at the Canvas Gallery on the August 13th, 2018. As per the trend, Canvas was crowded with students, teachers and art lovers. As I entered the gallery, people were gathered in the first left room and were astonishing at something; that was a colorful bovine (commonly called a buffalo) placed in the center, crowded with a lot of people. No one could ever understand, until explicated by Syed, the concerns and concepts behind each one of the installation series. Syed successfully shaped his ideas in the best way possible to share his environmental concerns. Through his installations, he brilliantly renounced the monotonous way of conveying ideas; instead, he questioned intelligence, observation and concepts in arts. It was not easy to understand the other installations at a glance. I was hoodwinked to believe the art works to be some sort of fancy and fascinating installations, but the more I would go closer to them, the more I would try to dig deeper into the meaning. The other ten installations were displayed in a row under the beams of lights; I rushed towards them in greed of exploring what other wonders are there to treat my eyes with. I could see books placed after one another. 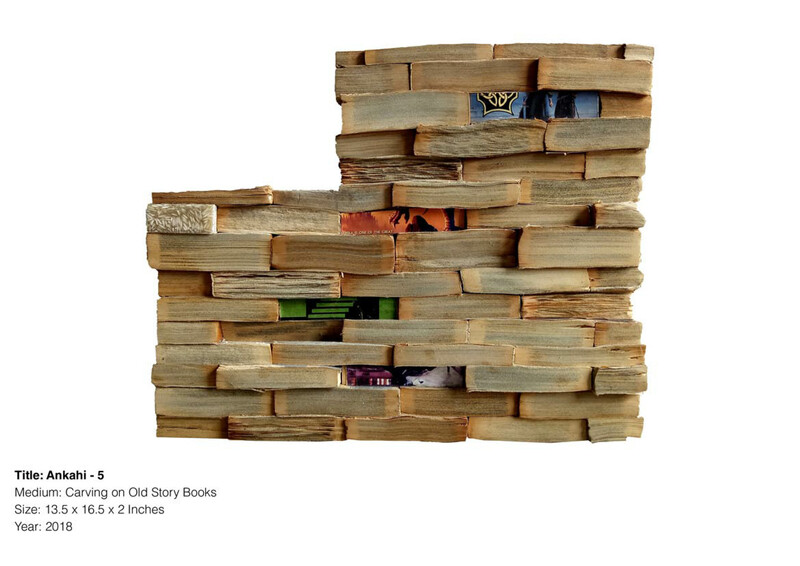 On a closer inspection, shaped like books were not actually books made of paper but resin, plastic and rubber were used to shape them as books. This series were titled ‘Bhook’, among these installations, seven had lentils and rice engraved in them, whereas the rest of the three would look fancy because of the additional use of metal and prints that depicted everyday life and necessities taking over the need of wisdom and education. In this fast paced human life, a lot has been neglected since technology has taken over human minds. Human are too busy to notice any change in the environment, climate or in their surroundings, the only change that affects them is their own loss or something worst that has reached them. In his installation ‘Bhook’, he welcomed his audience to open the new horizons and think of what is necessary for them. Running in the daily marathon of life, we do not realize that the only goal left in our lives is to educate ourselves to kill hunger and fulfill necessities. Syed had brought these major changes happening in human’s materialistic life – living by all of us – under consideration through his work. He used lentils and rice to depict hunger and the way they were engraved in the books depicted how, in past few decades, education has become a source of feeding the body, not the mind and soul. Syed had used bovine in other installations to give extension to his notion. 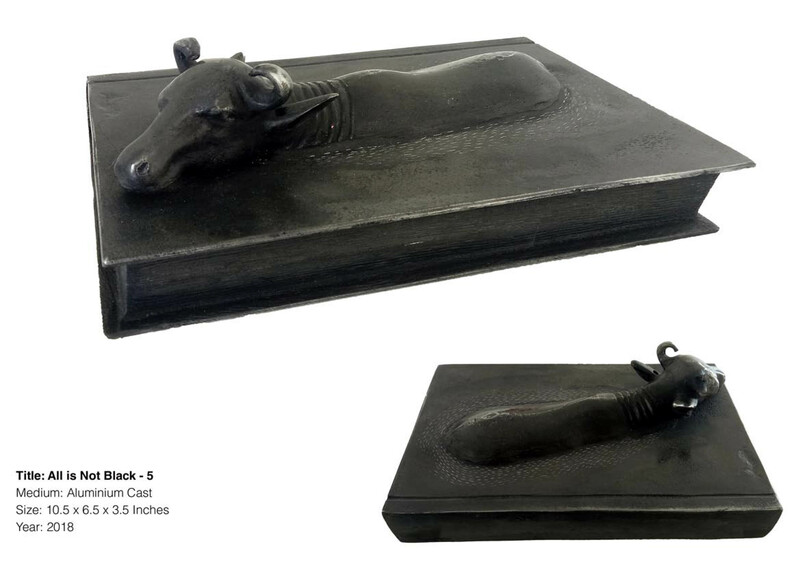 He used bovine as a symbol of life and wisdom, addressing various and unnoticed challenges and issues of the society. 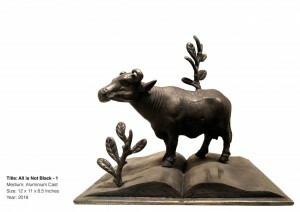 In his series, ‘All is not black’, bovine was crafted in aluminum cast in different measurements. This series was a brilliant extension to the series ‘Bhook’. Syed composed an aluminium crafted bovine with a book crafted in the same medium. He correlated life, nature and education, and evoked the significance of education in our lives which is going down the drain. 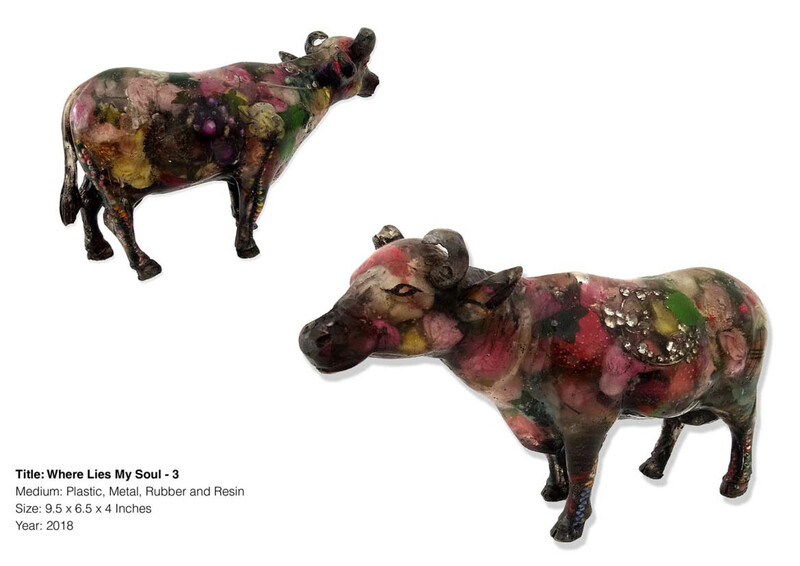 The very well-executed small bovine installations titled ‘Where Lies My Soul – 2’ examined the roughness and tension between the urban and natural environment. These bovines were as engaging as the life size installation was, placed together facing different directions. Syed had used plastic, metal, rubber and resin to produce these installations. Syed addressed the same issue through a simpler yet fascinating series of installation named ‘Ankahi’. Looked like colorful bricks, placed over one another were carved old story books to draw attention of the visitors towards the dying age of books in the world. Through his series ‘Ankahi’, he just not only pointed out that how the age of books has faded away with time, but he also explained the factors affecting our growth of intelligence and wisdom. Especially of our young generation who rather spend minutes to get everything from the internet than reading a book. The extra ordinary set of four independent installations helped understand the narrative of Syed’s ecological concerns. 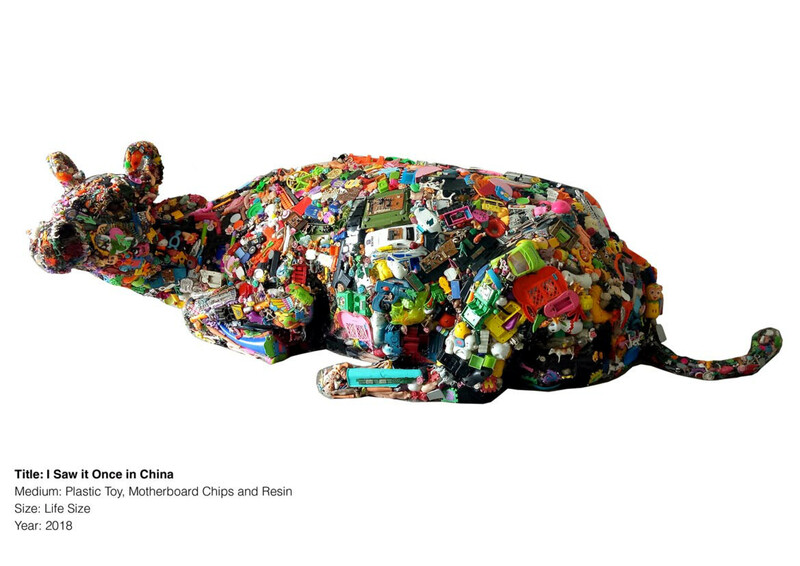 He translated the conflict between the artificiality of the environment, how is it affecting the urban life and increasing the tension between both. 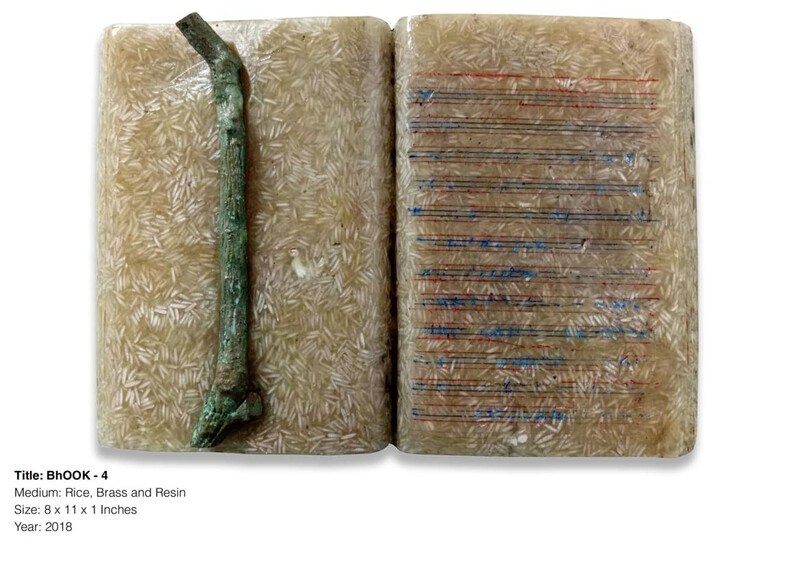 “I feel the responsibility to address the discourse through my practice by attempting to expand and translate the dialogue in a visual and intellectual domain. The ambition behind the production of ‘Ankahi’is to open new venues of interpretations and meanings”. ‘Ankahi’ was not only an art exhibition but a wake-up call to unfold the dark sides of this materialistic world. We should penetrate our eyes and minds to find the deepest meaning of an art work and discover what is beyond instead of just gazing at the art work for few minutes until we meet an acquaintance or a dear friend at the art gallery with who we can pose for a nice photograph. Syed is among those talented artists who are playing a vital role in shaping the society. We should not forget his prior efforts of taking art out to the general public. He always challenged the monotonous trends in art and introduced opinion oriented work so that the coming generation, of not only artists but a common man, could be introduced to art and art could be introduced to them without confining art to the rich and highbrows. Not only this, but there should be a space for questions that should lead to new ideas beyond borders which are already set in the arts.